Qmee search results (and their reward amounts) show up in the left panel of web browsers. If you've ever searched online (so, pretty much everyone) this applies to you. 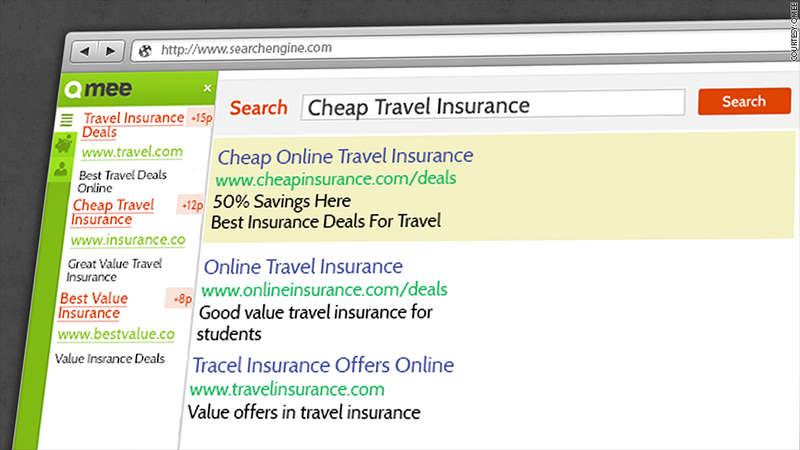 A London-based startup called Qmee will pay you to click on links that surface in search queries. Once you've installed the Qmee toolbar in your browser, searches on every major engine (Google (GOOG), Yahoo (YAHOF) and Bing, as well as Ebay (EBAY) and Amazon (AMZN)) will yield a list of results in the left-hand column. Clicking on these links (which look a lot like Google ads) can earn you four to 15 cents apiece. "Why wouldn't you want to get something back for something you do every day?" said Qmee founder Jonathan Knight. The more common the search (like "men's shoes" or "plane tickets"), the more likely there will be Qmee results. Theoretically, the results are directly related, although one search for women's dresses turned up for results for men's shoes. As the search industry ages -- Google (GOOG) just celebrated its tenth anniversary as a public company -- is Qmee giving users a peek into the future of search? Don't bet on it just yet. When I tested the app at CNNMoney, countless searches (everything from "prom dresses" to "movie tickets") turned up zero Qmee results. But on my home computer, searching the same terms turned up multiple Qmee results. A Qmee representative said my experience at work was abnormal and not a complaint they've received (although a coworker had a similar experience). Knight and co-founder Nick Sutton, both software executives, launched the "search loyalty" firm last year (the only one that offers up actual cash, according to Knight). The intention is to let users get a little something when searching online. After all, users provide data about their behavior every time they click a search result links. "Many loyalty programs require the customer to jump through hoops to redeem rewards," said Knight. Qmee cash is redeemable through a PayPal account (or you can choose to donate to charity). Knight says while this ratio could change in the future, "a larger percentage of our revenues will always go to our users." So far, it's just chump change for users -- the person who's accumulated the most money earned about $200 over the course of a year. But it has the potential to take a bigger piece of the pie. ZenithOptimedia values the U.S. paid search industry at $16.8 billion this year.